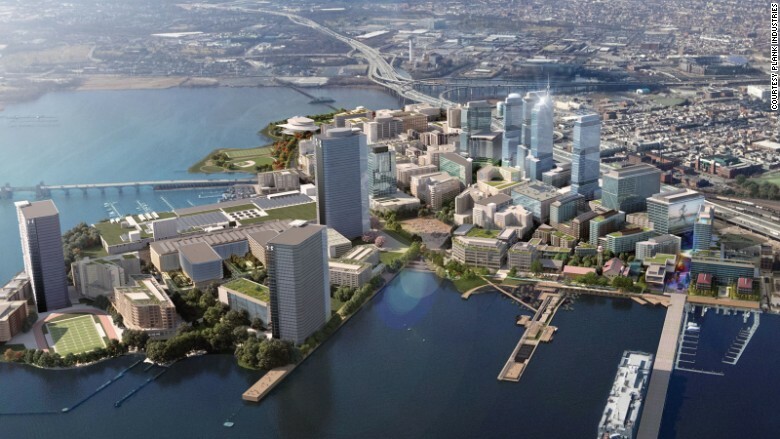 A rendering of the Port Covington development, in Baltimore. Baltimore is getting a hand from Goldman Sachs as it tries to become Amazon's second home. Goldman (GS) invested $233 million last month in a huge real estate project that could serve as a potential East Coast base for the e-commerce giant. The move came just a week after Amazon announced plans to open another headquarters in North America. Called "HQ2," the facility will employ as many as 50,000 workers. Cities are required to submit their bids by Thursday. Baltimore, which has been hard hit by the decline of its shipping industry, has identified the Goldman-backed Port Covington regeneration project as its best chance to land Amazon (AMZN). The city's economic development arm says the tech firm might be attracted by cheap living, world class universities like Johns Hopkins and easy access to railways, ports, interstates and airports. Port Covington, which boasts 235 acres on the waterfront, is a $5.5 billion "shovel ready" project that can easily accommodate Amazon's demand for 8 million square feet of space. The bid to land Amazon is not contingent on Goldman's investment, but Baltimore says it certainly helps. "The investment from Goldman Sachs demonstrates the strength of the Port Covington development and the city," said William Cole, CEO of the Baltimore Development Corporation. The Goldman investment was made by its Urban Investment Group, which has pumped $6 billion into cities battered by natural disasters (New Orleans) or struggling with violence and economic malaise (Chicago, Detroit). Port Covington has other major backers. 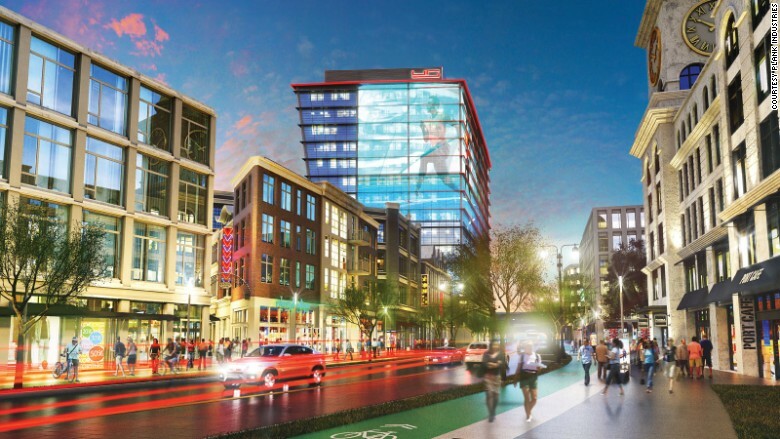 Sagamore Development, the company behind the project, was co-founded by Under Armour CEO Kevin Plank. His sportswear firm, also based in Baltimore, plans to relocate its own headquarters to Port Covington. Port Covington boasts 235 acres. Maryland Gov. Larry Hogan is also supportive of the Amazon bid, and has promised funding to improve Port Covington's transportation links (mass transit is an Amazon request). Baltimore, which has suffered from decades of economic trauma, has controversially provided hundreds of millions of dollars in public financing to back the Port Covington project. Critics argue that the money would have been better spent on schools and other critical needs, instead of a large redevelopment project. Goldman says it will track the social benefits that result from its "impact investment." The bank will measure the project's success by looking at metrics including hiring and workforce development, funding for education programs, recreation facilities and youth summer jobs.